The Orissan temples broadly pertain to three orders locally known as the Rekha-deul, Pidha-deul and Khakhara-deul. The sanctum with the curvilinear shikhara [rekha] is called the rekha deul and the mandapa with the (jagamohana) with a pyramadical roof of tiers(pidhas) is known as pidha deul. In a typical Orissan temple the latter two form the component parts of a single architectural scheme. The later Orissan temple adds in front two more mandapas known as the nata mandapa [dancing hall] and the bhoga mandapa[hall of offering] in the same axis. It is however to be noted that in the earliest group of Orissan temples the Pidha deul is wanting and the mandapa is a rectangular pillared hall covered by a low flat roof of two sloping tiers with a clerestory in between. Temples of the third order viz Khakhara deul are are only six being known from Bhubaneshwar. An oblong plan and a wagon–vault roof, characterize them. 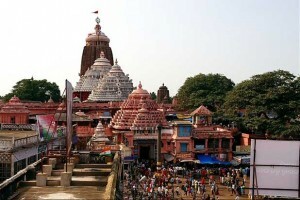 The temple of Jagannath Puri is a rekha deul with curvilinear tower on a pancha ratha plan and was built by Ananta Barma Chodaganga Dev during 12th century A.D. and was completed by Ananga Bhima Dev. This temple is one of the tallest monuments in the country, height is about 214 feet from the ground level. It stands on an elevated platform of stone measuring about 10 acres, which is located in the heart of the down town and presents an imposing sight. The temple is bounded by two enclosures. The inner enclosure is 400′ x 278′ and is known as kurma bedha. The outer enclosure is of 665′ x 644′ with the height varying from 20’to 24′ is popularly known as Meghanad Prachir. The temple has four gates at the eastern, southern, western northern midpoints of the Meghanad Prachir and are called Lions gate, Horse Gate, Tiger Gate and the Elephant Gate respectively. The temple has got four halls in a row such as Viman [main temple where Lord Jagannath is worshipped with brother Balabhadra, sister Subhadra and Sudarshan, Jagamohan (Audience hall], Natamandap (Dance hall ) and the Bhoga Mandapa [offering hall].